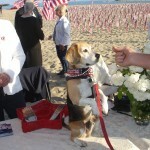 Santa Barbara Tea Party & Culpepper Society – Page 6 – Santa Barbara Tea Party & Culpepper Society is a nonpartisan group of citizens dedicated to defending the principles of the Founding Fathers, especially the Bill of Rights, economic opportunity and the American Dream. 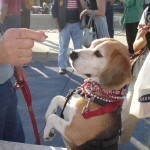 Santa Barbara Tea Party & Culpepper Society is a nonpartisan group of citizens dedicated to defending the principles of the Founding Fathers, especially the Bill of Rights, economic opportunity and the American Dream. Should you be in the vicinity of Sacramento Saturday, attend the Guns Across America rally in the steps of the Capital Building. Click the image above for more details. We are in a real war – attend if you can! 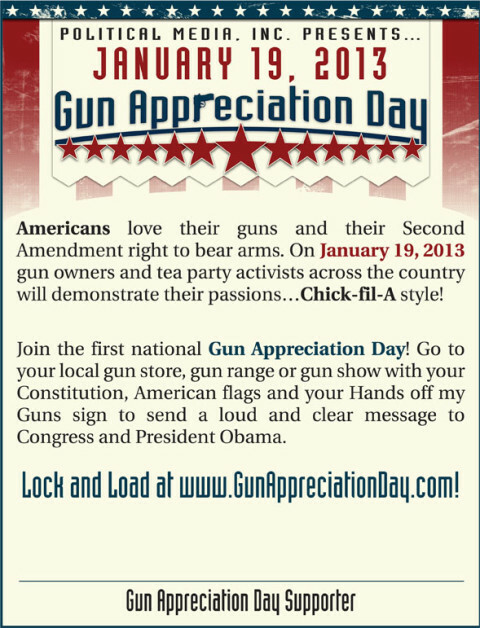 If you cannot – please go to your local gun shop and do a “Chick-fil-A” in support of your local gun store and in support of the 2nd amendment! Muslim Brotherhood’s plan to defeat America revealed in documents used as evidence in a U.S. Government trial. Recent events in Egypt were predictable and stand as a warning to Western nations. The MB’s history of supporting violence and terrorism. The shocking success of “cultural jihad” waged by MB front groups in America. “Democracy” under Islam differs radically with Western views. Seating is limited! Reserve Now! ACT! for America was founded by Brigitte Gabriel, a Lebanese immigrant who came to the United States after losing her country of birth to militant Muslim fundamentalists during the Lebanese Civil War. ACT! for America is a non-partisan, non-sectarian organization whose mission is to give Americans concerned about national security, terrorism, and the threat of radical Islam, a powerful, organized, informed and mobilized voice. Whether the specific threat is violent jihad, stealth jihad, the advance of sharia law, the influence of the Muslim Brotherhood, or the scourge of political correctness which is enabling the rise of radical Islam, ACT! for America stands ready to take action as the largest national security grassroots organization in America. Through informed community action, education, public policy initiatives and grassroots lobbying, ACT! for America is successfully combating the threat of radical Islam. While studying the influence of politics in financial markets, a lifelong career in financial services and private money management took an unexpected turn for Donald. His research revealed alarming accounts detailing Muslim Brotherhood influence operations in American politics and policy decisions. This triggered several years of in depth study, ranging from Islam’s foundational texts and history to consultations with National Security policy experts and former agency managers from the FBI, CIA and NSA. The picture that finally formed revealed the true intent of political Islam. Since learning about the Muslim Brotherhood agenda in America, Mr. Dix became a citizen activist, now leading a local Chapter of ACT! for America, a National Security focused grass roots organization encompassing 600 Chapters and 250,000 members nationwide . Don has organized outreaches to community leaders, law enforcement and local elected officials alerting them to what he now understands to be the defining issue of our time. I don’t presuppose to be an expert on elections. This is an analysis from just an everyday person who was watching what happened in the 2012 election and is really upset with the outcome. What went wrong? There are a multitude of factors that sealed the outcome of this campaign. I’ve seen analysts that focus on one or the other factor, but, it seems to me, that there was a broad collection of factors that made this election turn out so badly for Republicans. I take a look at the candidate, the Republican Party, how this election turned out so differently than 2010, what the Democrats did successfully, and how treachery affected the outcome. First, let’s look at the Republican candidate, Mitt Romney. I recently wrote that the candidacy was flawed. Let me clarify. Romney was among the most qualified candidates to have ever run for the office of President of the USA. He is a wildly successful businessman, a successful politician, a proven leader, who understood economics. Compare that to his opponent, Obama, who doesn’t understand any math beyond the 7th grade, by his own admission. This is an astonishing difference. Romney’s work with the Olympics and Bain Capital alone should have been enough to get him elected. There are flaws, however. He had a very difficult time explaining his support of Romney Care and making statements like he thought it was a good model for the USA. He had a very liberal record overall while Governor of Massachusetts. Yes, I understand the explanations; that he was dealing with a largely Democrat and liberal legislature. So what? It was still very liberal. Was he able to get elected to the governorship of a very liberal state? Yes. Was he able to work across the aisle? Yes, very effectively. As conservatives, the phrase, “Work across the aisle” simply means that we are willing to be liberal in the end. Conservative principles are completely lost in the translation of working-across-the-aisle. It becomes a matter of being really liberal or just sort-of liberal. What we need is a conservative House, a conservative Senate, and a conservative president. Idealism? Maybe so, but if we are to move this country back to its foundational principles, that is what we need to overcome liberal compromises. Further, what are Romney’s core principles? Are they liberal, work-across-the-aisle, or conservative? How does the average person determine Romney’s core principles when his actions are all over the map? While governor, he was mostly liberal, supporting issues like abortion and Romney Care. During the primary, he was very conservative, even making statements like “self-deportation” when it came to illegal immigration. During the final race, he went middle-of-the-road again. He did a great job picking Ryan, then shut him up, like McCain did to Palin. This is the establishment way of doing things – appealing to the so-called independents by being somewhat liberal. Still, what are his core political values? I sure don’t know. Romney is also an adherent to the Mormon faith. Am I saying that is a flaw? From a personal perspective, from a First Amendment perspective, and from the perspective of Article VI, Section 3, of the Constitution, it is not. There is no official religious test. However, from the perspective of a candidacy, I feared from the beginning that he would not inspire the Evangelical Christian vote. Romney is a very moral man, with extremely high personal standards. This is a trait that I wish all our candidates possessed. With the moral turpitude that pervades our society today, Romney’s personal standards are second-to-none. But, and it is a huge “but,” there is no way that Romney could excite the Christian conservative base. Did he get very key endorsements of the evangelical crowd? Indeed, yes. Did that excite that base to vote? Sadly, no. At least 2 million voters (compared to the McCain campaign) stayed home. You would have thought that the votes for Romney would have exceeded the count for McCain by millions had the base been excited. Finally, he appeared to be a stiff, rich, white guy, who had no connection to the people. I will deal more with this issue below, but suffice it to say, he was painted with that brush by the Obama campaign and he never recovered from it. The Republican Party has, once again, shot itself in the foot. It has successfully snatched defeat from the jaws of victory in several presidential elections now. As has been mentioned, the old adage, “A rising tide floats all boats” has been replaced with, “A receding tide strands all boats.” Not only did the party not win the presidency, it lost the Senate in a big way and it lost the entire State of California to a liberal super majority. How could this be? Take the process of redistricting. In several cases, it appeared that the Republican establishment deliberately tried to gerrymander House districts to defeat conservative candidates. Take the case of Michelle Bachmann’s and Allen West’s districts. Was it deliberate on the part of the establishment? I don’t know for sure but is sure looks suspicious. Michele Bachmann barely won but Allen West has lost, short of proving voter fraud. Is it possible to really recover the Republican Party like Reagan did? Reagan was truly an extraordinary candidate. Is there another Reagan out there? I can only hope that there will be in 2016. Which of the candidates in the Republican primary might have been better candidates? Sadly, not one. In one analysis I saw, the claim was made that there was only one way to defeat a black Democrat and that was to nominate a black Republican. Herman Cain was that analyst’s choice. Yet even Cain, who had good credentials, was flawed in his own right. There was no candidate in the primary who could have risen to the occasion, in my opinion. Conservatives tried candidate after candidate. All were found wanting. While the double standard of extra-marital affairs is alive and well, where Democrats are forgiven and Republicans are disqualified by them, we really expect our candidates to meet a higher standard. So, what made such an extreme difference between the Republican blowout in 2010 and the major defeat in 2012? The difference is that Barak Obama was on the ballot in 2012 and he was not in 2010. 2010 was, basically, a single issue election. It was all about Obama Care. Obama Care was almost universally hated. Scott Brown broke through the Massachusetts Kennedy dynasty over Obama Care. Obama Care was the issue that turned everyone’s stomach. The Tea Party was born over it. 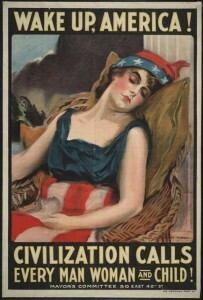 Rallies and protests were rampant over it. Town hall meetings were overcome by it. And, it was a district by district election where smaller districts of voters could have a nation-wide effect. What was the 2012 issue? Scott Brown lost to a radical liberal who was caught lying about her heritage. What happened? In 2010, there was passion to overturn Obama Care. What was the passion for 2012? Identity politics and the Stockholm Syndrome. Not only was every special interest group promised freebies, but the nation is, slowly, coming under the influence of Stockholm Syndrome. Specifically, we are becoming satisfied with our captors (government,) we are now identifying with our captors, and we have become satisfied with what our captors are willing to give us. No longer did Obama Care provide the central, overarching issue. Freebies did. Identity politics did. Feelings overtook thinking and feeling good about your candidate was far more important than what he was doing. What was Romney’s core issue? He tried to run on Clinton’s, “It’s the economy, stupid.” Did he make very clear and understandable points? As of this writing, all I can remember was that he was going to create 12 million jobs. I cannot recall how or what specifically he would do. What do you remember? Do you remember anything like that little phrase of Clinton’s? No. Why couldn’t he have picked an issue or two or three beyond the economy and pound them home? Pound them and pound them with sufficient detail. Pound Obama for his cover-ups and pound him again. Why did he give up on Benghazi? To appeal to women who supposedly don’t like confrontation? Obama was certainly confrontational and no one objected to that regarding the women vote. Most women I know want a man to be a MAN. I certainly would rather lose having portrayed Obama as the lying, cheat that he is than lose being a wimp. Finally, the 2008 campaign was won by Obama on two major fronts. One was the Hope and Change myth. We all know how that came out. The second was that he was the first black to ever run for that office and he succeeded to a large degree on the guilty white vote. How could you not vote for the first black president, given the history of slavery? Obama was insulated from criticism because he was black and anything to the contrary was labeled as racism. That factor has not changed. In the 2012 campaign, every criticism of Obama was labeled racism. Throughout his last 4 years, every scandal that has arisen has been defended by attacking the accusers for being racist. Even though Obama received 8 million fewer votes than he did in 2008, those votes did not convert to Romney. Our society as a whole has made an incredible transformation. In 1776, when the Declaration of Independence was signed, it was copied, published, and read in every corner of the colonies. It was read in pubs, on street corners, in town squares. It was read aloud so that those who were illiterate could hear and understand the document. People wanted to know. The illiterate wanted to know! People then discussed the document in every venue that was available to them. The facts were thoroughly vetted and discussed. People knew what the issues were. They were engaged, they were smart, and they knew what was going on and what was about to happen. Today, the thinking process has been largely replaced with feelings. In so many discussions I’ve had with people, I’m often asked, “How do you feel about that?” Even though they often mean, “What do you think about that?” The Obama campaign has taken full advantage of that transformation. Every ad, every speech was designed to illicit negative feelings about Romney. He was a rich white guy. He wanted to return to the policies that failed. He wants to throw grandma off the cliff. He was responsible for an employee’s cancer death. Romney wants to take away Roe. Romney wants to take away birth control. On and on and on it went. All of it untrue, of course. But it was focused on getting people to feel as if Romney was a real bad guy. Likewise, the Obama campaign did everything to make people feel good about him. He was able to promise endless freebies. Obama Care will take care of all your health needs. Obama-phones will be given to everyone. Unemployment benefits and disability benefits will continue forever. The energy shortage will magically disappear through green energy projects. Jobs will be abundant. Taxes will be low or non-existent to everyone except the evil rich bastards. All of it also untrue, of course. But the thinking crowd knew that. The feeling crowd didn’t. The Romney campaign was based on facts and specific promises. I remember talking to one person about the campaign. This person did vote for Romney, but told me that it was like pulling teeth to vote for him because he felt like Obama was such a nice guy and Romney was such a rich, evil man. The deciding issue for him was the economy. Yet he almost voted for Obama out of his feelings! And this was a really smart person! How do you deal with this? How do you get people to think? Our K-12 schools have become feeling and liberal indoctrination centers. Our colleges and universities are also feeling/liberal indoctrination centers. They are both oriented to Marxist/Utopian ideology, which, again sounds good – makes one feel good about it – but is an utterly failed philosophy in fact. But what do facts matter anymore as long as one feels good about it? I wish I had a good answer. Finally, there is the factor of treachery. It is becoming apparent that rampant voter fraud has taken place in this election. With a number of Philadelphia and Ohio districts voting 100% for Obama, you’d think that it would be obvious what is going on. There is nothing they won’t stoop to to achieve success. From running the most negative campaign in my lifetime, to massive voter fraud, to incredible lies and distortions, anything goes. Voter ID laws, in the states that are willing to address it, must be supported at all costs. Folks in districts that have significant fraud taking place must take some action. Electronic voting machines must be eliminated as a valid way to collect and count votes. As a former computer guy, my warning to all is that there are computers that have been hacked and there are computers that will be hacked. Electronic voting is easy to hack. Every electronic voting machine that has ever been tested for hacking has, indeed, been hacked. While paper voting can also be affected by fraud, it is not nearly as easy. Further, one way automation could help is to provide a way for an individual voter to look up his or her actual ballot, to see if it was counted and how the vote was recorded. There are many secure ways to permit this lookup and this would provide a way to ensure that your vote was recorded correctly. Voting should also be in person if at all possible. Vote-by-mail is easily subject to fraud. We should return to absentee ballots and limit them to legitimate reasons and require a re-application for each election. Otherwise, go to the polls and show your ID. Also, there is the Democrat-complicit main-stream media. Can you believe ABC withholding that clip of Obama admitting that the Benghazi attack was the video, not terrorism? The entire media is transparently an extension of the DNC. They would not expose Fast and Furious, they would not expose Benghazi, they would not expose the New Black Panther voter intimidation case, they won’t expose anything that negatively affects Obama. The new media must continue to take up the slack. But also, the old media must be constantly confronted. Their bias must be continually attacked and exposed. Treachery is not new to the election process. When Jefferson was finally elected president by the House (the Electoral College was tied), it was probably among the most disgusting campaigns in history. Treachery is and will be a part of the electoral process forever. However, it must be countered! You cannot have one side throwing everything but the kitchen sink at you and not respond, to some degree, in kind. There is a reason nice guys finish last. Romney didn’t address any other issue, for all intents and purposes, than the economy. While that was critically important, a missing link was attacking Obama for his failures. Isn’t it amazing how the Republican Party turns on itself when it fails? Right now, the Republican establishment is attacking the tea party for its loss. Are they serious? Why not attack voter fraud? Why not attack despicable Democrat tactics? Why not attack the main-stream media? But the tea parties? Who do Democrats blame for their failures? Republicans, of course. You never see Democrats blaming any of their many special interest groups. There are a number of issues that caused the loss in 2012. The Republican Party had better pay attention to all of these issues and stop blaming its major constituency. We have only one direction to go in right now. We must focus on 2014. Obama Care is still a central issue. It can still be stopped. But, to do so, we need the Senate. There is only one thing we need to do – find senate candidates who can win in 2014 and who are committed to stopping Obama Care in whatever way we can. That is not to say that all of the many other issues should be ignored. But, Obama Care is a central issue and it can still excite the base. And, even more important, we need to attack Obama for who he is. We must uncover all of the cover-ups and demonstrate that we, on the right, are not the wimps that the Democrats think we are. Further, we need to get into our local institutions. We need conservatives on city councils, boards of supervisors, and school boards. We need to watch out for activist judges and vote them out of office. We need to educate the populace that reason must trump feelings. These are all long-term projects. But, in the short term, we need the US Senate. Please, now is not the time to give up. More than ever, we need to take the battle to the streets, so-to-speak. 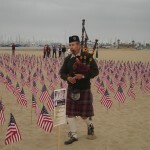 We just celebrated Veteran’s Day. 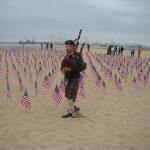 Let us now take to the battle and win the war at home, since all these brave veterans have won the war abroad. 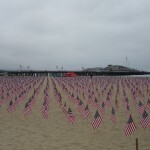 It is the least we can do to honor their service. 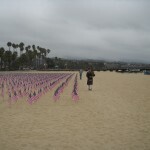 Santa Barbara Tea Party is a nonpartisan grassroots group of citizens dedicated to defending the principles set forth by America’s Founding Fathers. We are inspired by American heroes, from George Washington to Dolly Madison to Teddy Roosevelt, who have fought for and represent the American Dream. 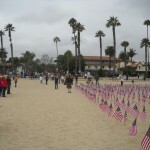 We are the core group that created and delivered Santa Barbara’s April 4, 2009 Tea Party with Lloyd Marcus and Tammy Bruce that garnered international media attention and spawned other tea parties along the coast. Our activities provide an open public platform for education and advocacy toward our specific goals of Rebuilding Prosperity (via a free market and limited government) and Preservation of Liberty (through the Constitution). Get involved. Let your Voice be Heard. Meet like-minded patriots. SBTP does not offer taxpayer advice; links are provided to taxpayer protection organizations. 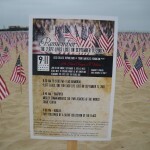 The 911 Tribute at West Beach attracted over 800 visitors from around the US and the world. Kudos and gratitude to all of you wonderful SBTP volunteers who generously gave of your time. Without you, it would not have happened. 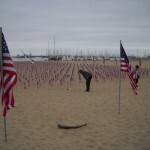 Over 50 of you planted 2977 flags, engineered by our Team lead by Gary Vandeman. SBTP angels hosted the apolitical hospitality table. 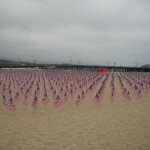 Hundreds of mourners, some sobbing and many grief-stricken, were comforted with their outpouring of love, With your help,, 2977 flags were harvested in 30 minutes. We are blessed that the donor made it a condition that SBTP coordinate and implement this event on behalf of YAF. In a unanimous vote on 9/12, City of Solvang decided to send a letter to CPUC asking for Smart Meter Opt-Outs for their citizens. The winning team of SBTP members and supporters was co-chaired by Eileen Anthony and Esther Andrews. Please Note: SCE told the Judge that we, their customers, are happy about Smart Meters, and they have had few complaints. What’s the entire County of Santa Barbara? Chopped liver? To extend the life of her husband, an 89 year old WWII veteran, Susan B replaced the SM PG&E forced on her with an analog. PG&E has threatened to turn off her power for a week. So far,, it hasn’t happened. Could it be that there are real estate rights and no mandate? SBTP is honored to be participating in this event. Come salute our warriors of the ’60’s & ’70’s. Consult media for details. BLURB (Santa Barbara, CA – June 27, 2011) Santa Barbara Board of Supervisors has taken the lead and scheduled a Public Hearing about increasingly controversial Smart Meters,making it the first Southern California county to do so. The history-making hearing has been dubbed The David and Goliath Battle, since it pits a coalition of concerned citizens, who will plead for protection from the trouble-ridden meters, against two multinational, multibillion dollar corporate giants, SCE and PG&E. The match-up, which has been provoked by the utility monopolies forcibly installing the pesky meters without customer consent and refusing to disclose the serious health, safety and rights risks and costs to consumers, will take place on Tuesday, July 5 at 1:30pm in BOS Chambers, Santa Barbara County Administration Building. Public comment will be taken. RELEASE (Santa Barbara, CA – June 27, 2011 ) – Santa Barbara County Board of Supervisors will hold a Public Hearing on Tuesday, July 5th at 2pm regarding the highly controversial and trouble-ridden smart meters that have sparked protests nationwide. As wireless smart meter installation proceeds into the Santa Barbara area, uneasy, angry and frustrated residents are pleading for protection and remedy from local elected officials. The history-making Santa Barbara hearing has been dubbed The David and Goliath Battle, since it pits a coalition of rank and file citizens against two multinational, multibillion dollar corporate giants, Southern California Edison (SCE) – which serves the southern portion of the county – and Pacific Gas & Electric (PG&E), which handles the north. Complaints against SCE and PG&E have focused on violations of consumer and civil rights, forced installation methods without customer consent and/or notification, nondisclosure of risks and costs, and health and safety issues. The recent release of an exhaustive scientific study by the World Health Organization (WHO) spiked more questions about the wisdom of the wireless smart meter program. WHO concluded that the radiation in cell phones – which is even more problematic in smart meters – is a deadly carcinogen. Other concerns include the smart meters’ direct impact on the economy, the environment and wildlife, property values, the sanctity and inviolability of the home, privacy and security as well as cumulative 24/7 exposure to the most vulnerable: pacemaker wearers, seniors, children, pregnant women, and electrosensitives. 43 California communities have already taken action to halt wireless smart meter installation, including Santa Barbara County’s immediate northern neighbors, San Luis Obispo County, Grover Beach and City of SLO. Consumer advocates are promoting an Opt Out Program (for freedom of choice) at no cost to the customer and the ability to retain their safe, reliable analog meters. 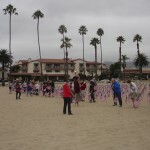 (Santa Barbara, CA – March 18, 2011) San Luis Obispo County just halted installation of smart meters. It becomes the 33rd California communitiy to do so. More cities and counties are awakening to the hazards of these privacy invading machines. Why? And why is the media silent? Get ready to test your Meter IQ and get the real scoop at “Are You Smarter than a Smart Meter” Townhall Forum. Our Big Annual April Event features a panel of national experts who will reveal up to the minute information (much of it not even available until then) on the latest Battle between Man and Machine. Copyright © 2014 Santa Barbara Tea Party. All Rights Reserved.